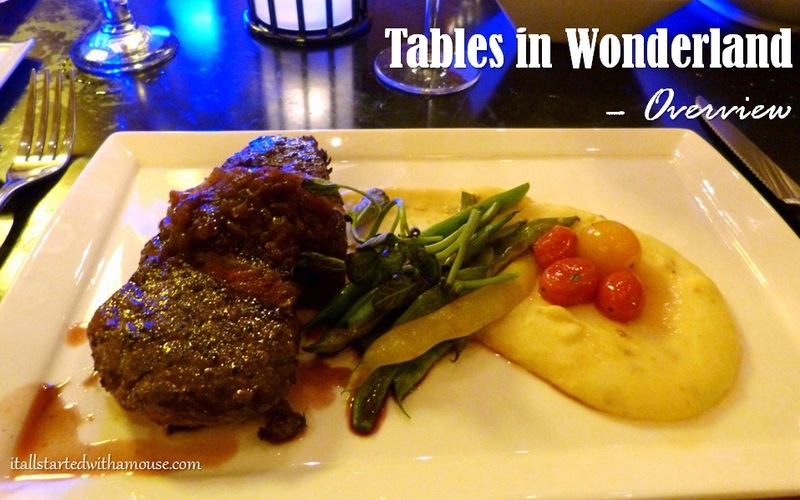 Tables in Wonderland is the Disney World dining discount membership program that is available to Florida Residents, Disney Vacation Club members, and Annual/Seasonal Passholders. Your Tables in Wonderland card is valid for one year from the date of purchase. Tables in Wonderland provides a 20% discount on dining at participating restaurants including your alcohol purchases. The discount is only available on food and drinks, not merchandise or photos. At any of the participating restaurants (see below), present your Tables in Wonderland card and Photo I.D. In addition, the name on the credit card you use to pay for your meal must match your Tables in Wonderland card. Visit Guest Relations at any of the 4 theme parks or the Disney Springs location. You must be at least 21 years old to purchase. You must present a photo ID and either your DVC Membership Card, or Annual/Season Pass Card. Florida Residents and Annual/Season Passholders may also purchase via phone. What about large dining parties? Parties up to 20 people are covered if the Tables in Wonderland cardholder and the secondary Tables in Wonderland cardholder are both present and pay for the check. Can I use Tables in Wonderland with the Disney Dining Plan? Yes! The Disney Dining Plan does not include any alcohol, therefore when you use your Dining Plan to cover your meal, you can present your Tables in Wonderland card to receive the 20% discount on alcohol or other items that are not covered with the typical Dining Plan entitlement, so long as the restaurant participates in the Tables in Wonderland program. Where can’t I use it? The card excludes merchandise and photos. In addition, it excludes all Chef’s Table Experiences at the Signature restaurants, Fantasmic Dinner Packages, Food and Wine Festival events, Candlelight Packages, or other special events. You cannot combine the Tables in Wonderland discount with any other discounts. Tables in Wonderland is subject to certain blackout dates. This includes Mother’s Day, Easter Sunday, Independence Day, Thanksgiving Day, Christmas Eve, Christmas Day, New Year’s Eve and New Year’s Day. In addition, 1900 Park Fare, Chef Mickey’s, ‘Ohana (Dinner Only), Cinderella’s Royal Table, Les Chefs de France, Akershus Royal Banquet Hall, Le Cellier Steakhouse have the additional blackout dates of November 22-28, 2015 and December 20-26, 2015. After 5pm, show your Tables in Wonderland card at the Auto Plaza to receive free parking. You can use your Tables in Wonderland card on participated pre-paid dining and dinner shows. Request your discount when you book the reservation and be sure to bring your card when you pick up the tickets to get your discount. In addition, should you forget at the time of booking, you can present your card when you go to pick up your tickets to receive a discount. Note: Participating restaurants are subject to change without notice at any time.